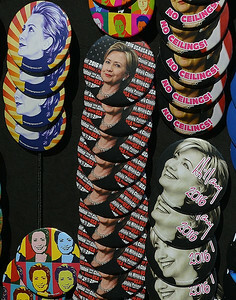 Images of people at Hillary Clinton book signing including volunteers wearing campaign buttons and talking to book buyers, people reading the book, campaign bus with large lettering and posters on it, and protesters with signs, red flags and banners demonstrating against free trade treaties, war and deportations. Protester with sign opposing TPP free trade treaty, Hillary Clinton campaign bus in background. Protester with sign opposing TPP, and NAFTA free trade treaties and Koch brothers, Hillary Clinton campaign bus in background. 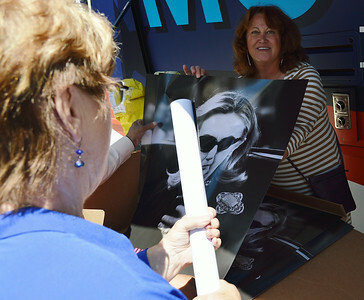 Volunteer holds up poster of Hillary Clinton, woman with rolled up poster in foreground. 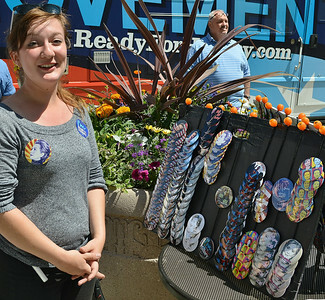 Young woman standing in front of large display of Hillary Clinton campaign buttons. 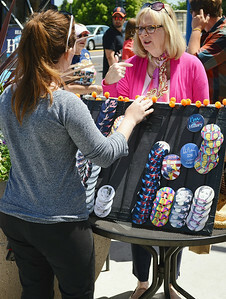 Woman gestures while speaking to other woman in front of large display of Hillary Clinton buttons. Man holding clipboard and Hillary Clinton buttons. Young woman with Hillary Clinton stickers around her neck shows paper on clipboard to woman holding Hillary Clinton book. Woman gestures with hand while talking to 2 other women, both holding Hillary Clinton book. 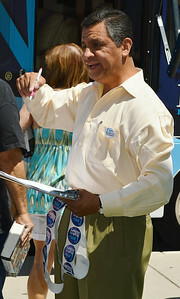 Man holding clipboard and Hillary Clinton buttons gestures with hand. Man holding clipboard and Hillary Clinton stickers gives sticker to man holding Clinton book. 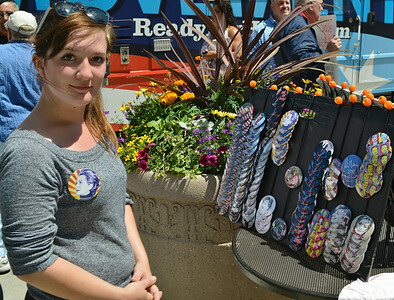 Woman wearing Hillary Clinton button, holding clipboard. 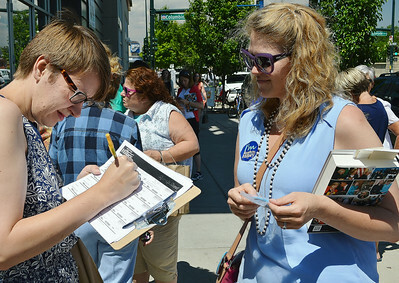 Woman signing paper on clipboard, volunteer wearing Hillary Clinton button and holding book, looks on. 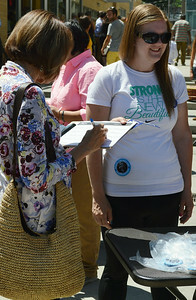 Woman signing paper on clipboard, young woman wearing Hillary Clinton button standing next to her. 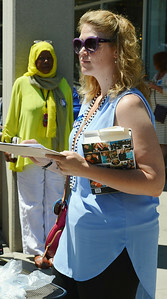 Young woman holding clipboard and Hillary Clinton book. 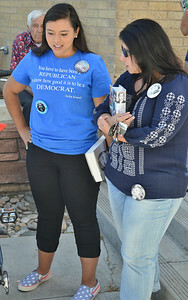 Two young women wearing Hillary Clinton buttons and holding books. 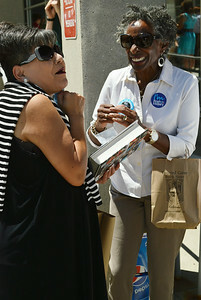 Two African-American women speaking to each other, one wearing Hillary Clinton button, other holding Hillary Clinton book. Young woman wearing Hillary Clinton buttons shows paper on clipboard to woman holding Hillary Clinton book. 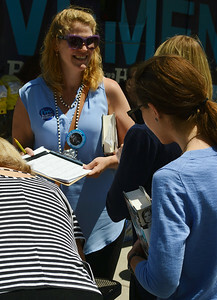 wearing Hillary Clinton button smiles as another woman holding Clinton book signs paper on clipboard. 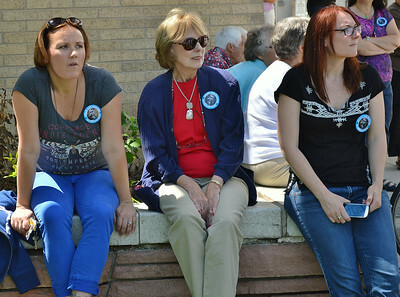 Three women wearing Hillary Clinton buttons sitting on stone wall. 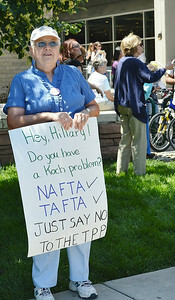 Protester with sign directed at Hillary Clinton, opposing TPP, and NAFTA free trade treaties and Koch brothers. 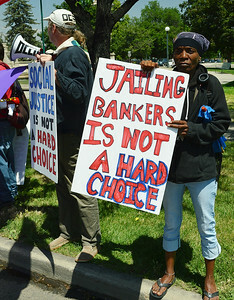 Protester displays sign about jailing bankers. 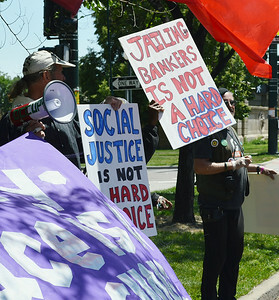 Protesters with signs about social justice and bankers, directed at Hillary Clinton, also displaying red flags. 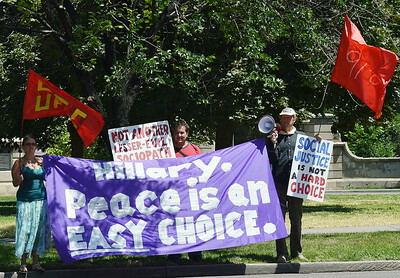 Protesters with signs and banner about social justice and peace, directed at Hillary Clinton, also displaying red flags.